An exchange of goods is simplistic; it has no intellectual nuance. For those outside the 1% the intellectualisation of economic systems is the only tangible way to have agency over them. Agency in our contemporary world also comes from free access to information. Perhaps we can all admit at least one instance where piracy has enriched our cultural lives. Sean Parker’s Napster brought access to free music into the teenage homes of those on the cusp of between millennial and Gen X. Free culture grew from first a generational want and into a wider (Western) cultural expectation. Developments in software came out of the open source movement, where people give their expertise for free. The operating system on your $$$$ MacBook is a version of Linux; a free operating system. A teenager invented a new way to detect pancreatic cancer by using articles from the JSTOR database downloaded and distributed for free by the late activist Aaron Swartz. The Internet’s Own Boy (2014) directed by Brian Knappenberger details Swartz’s journey through the development of the Creative Commons to his arrest for the downloading and distribution of the JSTOR database whilst at MIT. Through Wikileaks and information handed over by Chelsea Manning, Julian Assange distributed information detailing corruption in Western governments. Curiously Assange also had an early interest in cryptocurrencies like Bitcoin. Just like video and performance art before it, the immateriality of net-based art proves a problem for capital. These practices do not suit the traditional commercial gallery/object model and have often been in a position to critique economic systems. UBERMORGEN’s Google Will Eat Itself (gwei.org) buys Google shares with money generated from Google Ads. Other artists have offered alternative payment models; Rafaël Rozendaal sells the URLs of works and Bitcoin Cloud (bitcoin.at) “builds a direct relation between the attention it receives and its market value”, which is similar to Petra Cortright’s formula pricing of YouTube videos in relation to view count. In both these works attention and voyeurism become a currency. Attention and appreciation (often confused as the same thing) carry ‘value’ on social networks like Facebook, Instagram and Twitter. Our connections, relationships, interests, browser history and ultimately keystrokes carry a value; this is why Google shares are valued so much on the international stock markets. The personal information we give away freely through search engines, social media channels and web-based email clients like gmail is worthy of being mined by advertisers to market products back to us, based on the algorithms corporations like Google create for this very purpose. Erica Scourti explores this world of corporate feedback in Life in AdWords (2012-13) where she emailed a daily journal to herself in gmail for a year. Scourti recorded the advertisements Google played back at her based on her emotional states, life plans and basically anything she mentioned that could be a pivot point for a potential sale. It is also worth stating that these incursions into private communications also have a political value. This particular type of intrusion features in the refrain “I know that you know me better than I know me” of Holly Herndon’s track Home (2014). Written in reaction to the Edward Snowden revelations, Home explores the personal unease felt by the enormity of government-sanctioned information gathering over the internet. Herndon’s music currently explores the ambiguous space between corporate and governmental spying; in both systems the consumer/citizen are not compensated for their input. In 2013 curator Lindsay Howard organised Paddles ON!, the first digital art auction in collaboration with Rhizome (rhizome.org) and Phillips auction house in New York. The structure of the auction wasn’t to benefit an already wealthy collector or trust; as is often the case on the typified frenzied auction-room floor we associate with $$$$ contemporary art. The money was transferred to the artists and Rhizome in order to support their work commissioning and preserving digital art. It is worth creating a new window here to discuss alternate ways art can be funded; commissions by organisations in particular provide a supportive framework for the development of new (unrestricted) work, young artists and those, currently working under the fatuous banner of ‘digital’, who have practices that are not solidified into a physical object. The essay Working Artists and the Greater Economy (W.A.G.E. )—Online Digital Artwork and the Status of the ‘Based-In’ Artist (2015), commissioned by e-flux, discusses the economics of the current art world and how that impacts on the payment of artists working digitally. Originally started as a “a tool that sets compensation for digital artworks in relation to the prevailing living wage of the city or region where the commissioned artist resides”. The text in part discusses the impact of wider economic systems on the whole workforce of the art world and aims to utilise this understanding to trace equitable fi nancial compensation for digital art. When Paddles ON! 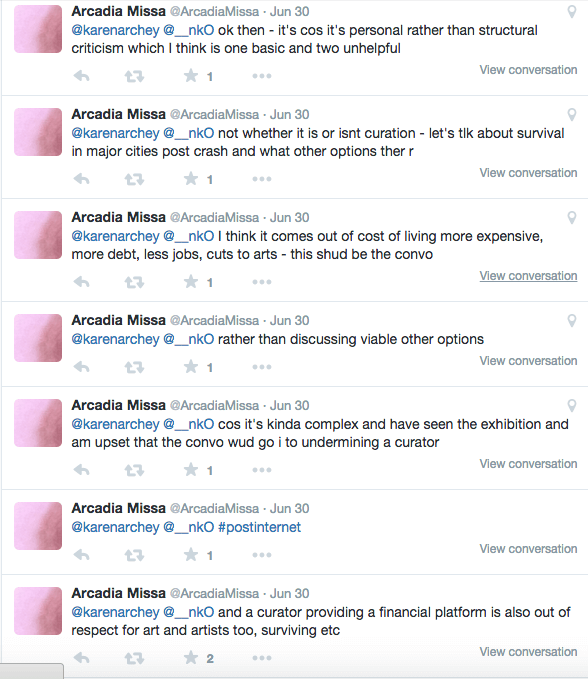 happened in London during July, 2014, a long debate rumbled on between London gallery Arcadia Missa @arcadiamissa, Karen Archey @karenarchey, Nicholas O’Brien @__nko, Ben Vickers @benvickers_ and Lindsay Howard @lindsay_howard. To cut a long conversation short @arcadiamissa made the point: “ …let’s tlk about survival in major cities post crash and what other options ther r”. This less than 140 character point is salient. We need to evaluate why artists and galleries need increasing amounts of money in the first place. Running a gallery and having a practice based in London is expensive; rising property prices, high rents, depressed wages and the prominence of financial institutions are a few reasons why. Artists and galleries ‘struggling’ for money are symptomatic of much wider ideological issues than merely the sharing of cultural material for free. This essay is a companion piece to the Sluice__2015 talk 'Copyright / Copyleft' which Laura participated in.